My good friend RVA Playlist will celebrate 4 years of highlighting the Richmond music scene with a birthday party at The Camel Wednesday May 28 starting at 7pm. The feature of the night will be a FREE show from Richmond bands Vexine, My Darling Fury, and The Trillions. Before the music starts at 8pm, The Camel will tap my collaboration with Lickinghole Creek, Farmers Market Saison. Created especially for RVA Playlist’s 4th Birthday Party, Farmers Market Saison is cask conditioned version of Short Pump Saison with ingredients found on the first day of South of the James Market’s spring season. 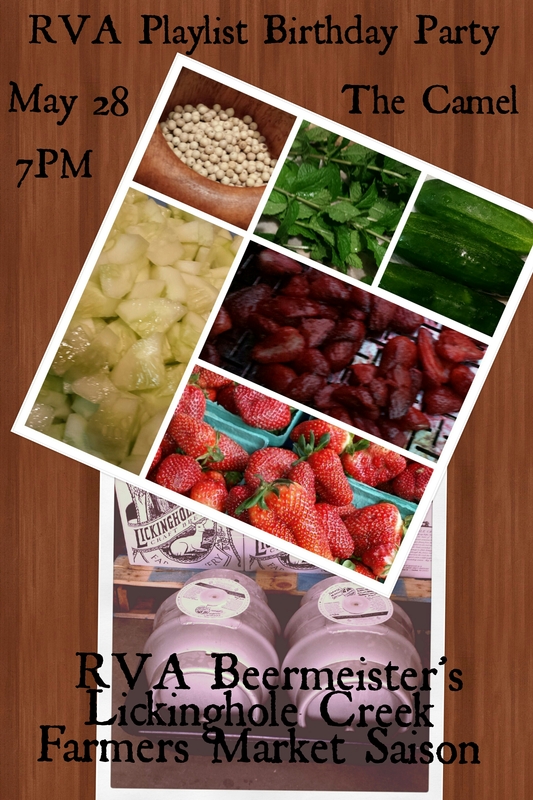 On May 3rd, I found Agriberry strawberries, Pleitez Produce’s pickling cucumbers, and Village Garden’s herb blend. The strawberries were coated with turbinado sugar and some of the herb blend then grilled over charcoal. The cucumbers were simply peeled and chopped. Small additions of lemon peel, cracked white peppercorns, more herb blend and homegrown mint were added to the pin before allowing it to condition for three weeks. The pin will be tapped when the doors open at 7pm. So come out and enjoy a beer and stay for what will surely be a great night of live music. Head over to the Facebook event for more information and updates.